EdTech Innovations: Modern Learning Spaces - What took so long? 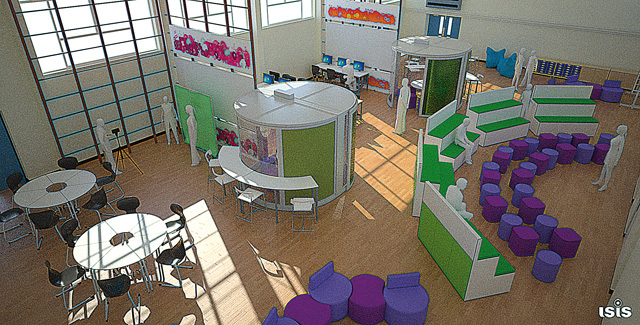 There has been a lot more talk about innovating the way we set up our learning spaces. Although I agree that the design of learning spaces has an impact on learning, I wonder why it has taken so long for this subject to get the attention it deserves. The arrangement of most classrooms I go into are still the traditional and outdated rows of desk or clusters of desk arranged into groups of four. Much about how our modern students learn has been mostly overlooked. Hopefully, until now. I recently attended the Tech & Learning Live - New York conference. It was a fantastic conference with many innovative educators presenting sessions in a collaborative and hands-on environment. One of the session that I participated in was titled, "Redesigning Your Learning Space on any Budget." This session gave me many good ideas and inspirations. But, it also gave me pause. When we talk about redesigning learning spaces words like bright, comfortable, collaborative and flexible come to mind. These are all true and worthwhile but where have they been all this time? Why are we now realizing that these ideas fit so well into education? Sure, let's be collaborative, let's put our desk into groups of four or a circle. But, they are still desks and we are still in a classroom in which students have to look back at the teacher at the front of the class at the board. Not much different. When you want collaboration and flexibility you have to look at how kids work at home. For instance, my daughter was reading a book in the living room. She started sitting in an arm chair rather "normally." Then, in the span of thirty minutes I watched her change her position no less than six times. The positions included sitting forward, sideways, laying cross-chair and ottoman, upside down, kneeling and then onto the floor. Not once did she stop reading! Most adults couldn't do this, in fact, it may be downright distracting to them, but to kids this is normal. So, I ask, why can't we do more of this in schools and let the kids learn as they are, not as we think they should be learning? So, I ask, what can we do to change this paradigm of thought and be more agile in our learning space transformations? Why? Because we need to do some catching up! From what I have seen they are more the exception than the norm. Schools that have classrooms like these are seen as "cutting edge," or "progressive." I say that this should be the norm and I want to know what we can do to do about this without paying the premiums that vendors want us to pay. How can we get those mobile, height adjustable desks and work areas in a classroom that allows you to write on any almost surface? I have seen so many models, but many involve large budget, vendors, architects and designers. How can we do this better with what we have or on a budget? No, it's your turn to sound off. Let's share resources, thoughts, complaints, opinions. That's what I always wanted this blog to be about. It should be a dynamic collaborative space. So, what say you? Comment or Tweet me - #classredesign. I'm getting bulky everyday.The worst thing is that I can't fit me in office chairs and it's really very embarrassing. So, I thought to but ergonomic spacious best office chair under 200 dollars for me. It will be good for my health and will increase my efficiency as well. This segment is growing rapidly; after all your kids want to play more and study less and if games become the mode of learning, there is nothing like it. This is not to moderate the estimation of this sort of adapting yet to point out the marvel that as a best writing services rule the learning separated is not preplanned or in view of particular results. That is the reason teacher quality is as yet a matter of concern, even, in nations where students reliably get high scores in universal exams,helpful sites for writing for example, Trends in Mathematics and Science Study (TIMSS). Get the best online 201-450 exam questions from test4actual.com at affordable prices and pass in 1st try!. Education paradigm growing in Indonesia in this XXI century step by step has started leaves aspiration of the founders this republic nation-state MURANG'A UNIVERSITY that is that every citizen entitled to get education that is competent.